Tyddyn Mawr self catering holiday cottages in Rowen near Conwy are situated in North Wales, within the Snowdonia National Park. The cottages are on a traditional Welsh speaking family run beef and sheep farm farmed since 1889, and situated within 3 miles of Conwy. These holiday cottages in Snowdonia near Conwy are set in a farmyard complex of traditional stone buildings that have been tastefully converted to a high standard. Sleeps 4 + cot. Suitable for wheelchair user. Sleeps 6 + cot. On ground floor. Sleeps 2 + cot. On first floor. Sleeps 4 + cot. On first floor. Tyddyn Mawr is ideal for the 2019 National Eisteddfod. We now have wi-fi available in all cottages for our guests. The cottages benefit from a shared laundry room, and a games room with table tennis, pool, table football, books, videos and board games. There is Wi-Fi available in all cottages providing internet access for your wireless laptops etc. Set in 420 acres of farmland, visitors at this self catering accommodation can walk the paths and explore the private woodlands and wildlife on the farm. For the children there is a rustic timber multi frame play area. All the cottages are close to the farmhouse, so there is no problem if you need assistance at any time of day or night. The cottages are in a quiet rural location just 3 miles from Conwy. View the local area page for information on places to visit in and around this stunning area of Snowdonia. These holiday rentals are ideal for overseas visitors looking for vacations in North Wales where they can experience Welsh country life and explore Snowdon, Snowdonia, Llandudno, Conwy Castle and much more. 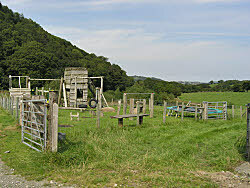 Tyddyn Mawr Farm, Rowen, Conwy, North Wales, LL32 8YL, UK. Content is copyright Snowdonia-Farm-Cottages.co.uk at Tyddyn Mawr, Conwy, North Wales, UK.